As a blogger, I am constantly asked what my top tips for bloggers are. I even have people in the offline world ask me to spend a day with them and teach them. Blogging is something that I don’t think that you can exactly “teach.” Learning as I went is what worked for me. However, there are some things that new bloggers can learn in order to improve their blogging skills. No, you don’t have to settle on one niche or settle on one direction, but it does make things a little more easier. My main website, Making Sense of Cents, is sort of a mix of everything possible, but I do try to make everything relate to money in some way. Are you a beauty blog? Lifestyle blog? Personal finance blog? Mom blog? Determine why you are blogging. Are you blogging anonymously? Are you trying to get your freelance services out there? Is your blog a part of a business? Are you blogging for money? Determine why you want to blog. Yes, you might like that post that someone else wrote. However, should you copy it? NOOOOOO! If you are looking at an article for inspiration or research, don’t copy it word for word. Read the article and then look away. If you read it sentence by sentence, then your article will most likely be exactly like the article you are researching. Yes, you can run a content mill where all you do is crank out articles that no one will read. However, if you are looking to entertain and keep readers, then having high quality and interesting content is key. I didn’t start my Twitter account until maybe a year or so after I started blogging. I really regret that because I was missing out on an important way to interact with readers and other bloggers. Allow sharing on your blog. If you want to gain new readers, then having a share plugin such as Shareoholic is key. This way readers can easily share your content. Do your social media icons actually link to something? Something that really bothers me is when I find a new blog that I really like, and they have social media icons on their sidebar that lead to nothing. Does your Twitter button just link to Twitter’s homepage? WHY do you do this to me?! Try not to look at your stats too much. I know that as a blogger, it is hard to just ignore your blog stats completely. However, stressing over them and looking at them multiple times each hour will not increase your stats. Just like with everything else, networking is very important. Talk to other bloggers. Interact with readers. Reply to emails. Have conversations on Twitter. Attend blog conferences if you can. Guest post on other websites. What tips would you give a new blogger? What’s something that you wish you knew when you started? Great tips! I still consider myself a newbie, but I would definitely add that you should read lots and lots (and lots and lots) of blogs. Note what you like, don’t like and think is missing. Then apply that to your own blog – not copying, but just emulating. I was actively reading and following other PF blogs for four months to get ideas and tips before I even started my own. Thanks! And yes, reading many blogs is another positive. Extending your reach is important. I don’t get much traffic from twitter at all either, but then again, my audience seems to be more on Facebook and Pinterest! I’ll say network as early as they can with other bloggers and make sure that they are able to publish an article or two every week and that they should be consistent with it. Love this! Even though I’ve been blogging for a few years I need to remember this stuff if I want to really get my blog out there! Love this, Michelle! I would say too, write from your heart. If you’re really meant to do this blogging thing, the words will come. Great tips here! Great tips Michelle! As a newbie blogger, I’m always looking for ways to better spend my time and energy on content and traffic. Great tips!! I used to be obsessed with my stats… thankfully I’m happy with where they are now, so I don’t pay *as much* attention anymore. I have a folder on my computer called “Topic Ideas” where I bookmark blog posts that either inspire an idea, or relate to an idea I already have. So when I get around to writing that post, or need a post idea, I have resources ready to go. Haha yes I still check them a lot, but not as much as I used to! I think reading other successful blogs teaches you so much about blogging. Commenting, sharing, and networking have been instrumental in building my traffic. Hey Michelle, great advice for a newbie like me. This helps give me something to focus on. Thank you as always! Hi Michelle- my husband and I just started our blog and these tips are incredibly useful. We are still ironing out kinks on the website, like adding buttons to link to our social media site, but we’ve already noticed importance of Twitter! Yes, Twitter is very important! Great article and very timely since I’m a fresh new blogger myself. Staying motivated to consistently write content was a big hurdle for me as I was trying to get the design of my website down at the same time. I think I’ve gotten the design down for the most part so I can post more consistently from now on. Thanks for the tips! Thank you. Good luck blogging 🙂 It is a lot of fun. I love all these tips! I’m guilty of checking stats too often on days I post new content and sometimes it can drive me crazy. I also was a bit late to the Twitter game. I didn’t (still really don’t) have a personal account and just cultivated one to be part of my blog persona. Yes, checking stats is something that I definitely do. It’s addicting. I wish I knew more about SEO when I started. Lots of opportunity out there. Very good advice here. I know I need to take some of it to heart and implement it on my own blog. I do agree that it’s tough to teach blogging. Most people have to learn it on their own in order to fully understand it. I often find people do not blog consistently. Nothing is more frustrating than finding a blog you think you may enjoy and then not having any consistent content. Make sure it is a frequency you can blog at consistently. These are some very good tips. 1. write good content, write it for your readers, not google. 3. be present on other blogs, be nice to people. …and never give up. Blogging is not easy and will probably not reward you too soon after starting, so don’t give up. Give your blog time, 3 to 6 months and only afterwards decide if blogging really is for you, but not sooner! Write and network. The rest of it will take care of itself if you find yourself truly passionate about it, but none if it can happen if you aren’t writing (a lot) and networking regularly. The networking part took me a while to learn and I still have a ways to go with it. Great post! How do you find the time to keep up with multiple blogs and multiple twitter accounts? I’m just beginning and find it tough – also working full-time and have a 5 year-old! I have one niche specific blog/twitter and one that is more general. Juggling isn’t easy. I love both your blogs by the way! Oh thank you thank you thank you for the Shareoholic tip! I was wondering how people did that to the bottom of their posts! I think a lot of your tips shoot right to the point that a lot of bloggers overlook. Sure, the easy way out would be to copy other sites and provide low-quality content but it ultimately won’t get you anywhere. 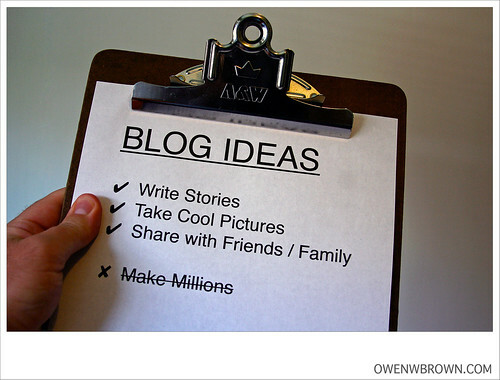 Also enjoyed your “5-ways to marketing your blog” post as well. Looking forward to reading more.